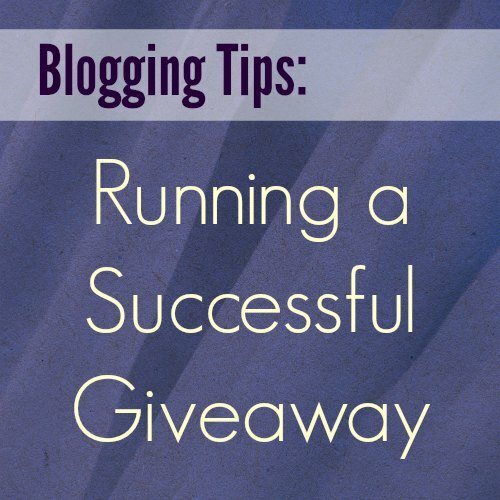 Giveaways are great for your blog – readers love entering contests and it drives lots of traffic to your website. Over the years I have learned some ways to become efficient at running a giveaway. Choose your giveaway widget & follow policies. There are numerous giveaway widgets, such as Rafflecopter and Giveaway Tools. I use the free version of Rafflecopter, which has some limitations, but it certainly works for me. Be sure to follow social media policies. For example, you cannot use Google+ as a giveaway option (you cannot promote a Google+ post as a giveaway entry, per Google+ policies). Another example is that Facebook does not allow Facebook follows as giveaway entries. Give your entrants a variety of entry options. First, make sure you incorporate as many options related to the sponsor and sponsored item – such as visiting or following as many social media channels as possible. You can get creative besides social media follows – other ideas could be: entrants visit the sponsor’s site and leave a comment about the sponsor’s product, sign up for an e-mail newsletter from the sponsor, or post an Instagram photo why they need to win (e.g. I did a giveaway for a toy organizer and made an option for people to post a picture of their toy mess to Instagram). Be clear about the giveaway rules. Put a disclaimer on your giveaway explaining the rules. Start with the basics of what the prize is, prize value, and who can enter (e.g. US only). Then you want to include other details – such as, the sponsor ships the prize, you are not responsible for ffulfillment, winner has a certain time period to respond to the winning e-mail (e.g. 48 hours), and so on. Also decide if there is a frequency that someone can win on your blog (such as one prize per month or one prize per three months). Promote your giveaway on all of your social media – I do Facebook, Twitter, Instagram, Pinterest, and Google+. Although some of those are a 1-time thing (such as Google+), other social media you can do as often as daily (such as Twitter). I schedule a lot of my tweets with Twuffer as soon as I post a giveaway so that I know there is a daily tweet going out for the duration of the giveaway. Capitalize on peak times – for example, Sunday evenings usually get a lot of views. You can do a Google search to find when best posting times are. People cheat – so check the entries. Also if the entrant was supposed to enter information (such as their Twitter username) but did not, I disqualify that entry because the rules were not followed and it takes far too much effort to track down that information (which is why I ask for it on the form). I get a lot of entries that I have to disqualify. Let me know if you have any questions – or feel free to add your own tips in the comments!